It was business as usual on the streets of Harare on Thursday as people walked to and from work, seemingly unaffected by the events of recent days. The only signs of the political turmoil that’s playing out in the upper echelons of power are the standard infantry in APCs stationed outside key buildings such as Parliament, the High Court and the airport, while the Presidential Guard was stationed outside the Zanu-PF headquarters. Military helicopters were seen occasionally, flying overhead. All photos by SHAUN SWINGLER. Photo: Soldiers sitting on a APC are stationed outside the Quality International Hotel in central Harare. 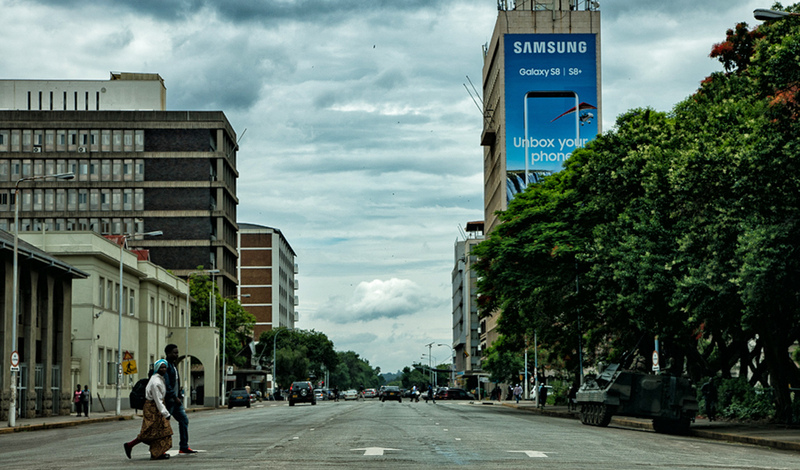 Photo: A soldier walks across the road in central Harare. Photo: People do their shopping at a market in downtown Harare. Photo: A man walks past the offices of the opposition party Movement for Democratic Change (MDC-T) in central Harare. Photo: The courtyard of the Harare Magistrates Court. Photo: Business as usual at the Harare Magistrate’s Court. Photo: A car parked outside a house in Highfield, close to the home in which Robert Mugabe grew up. Photo: A woman hangs up laundry outside her home in Highfield, close to the home in which Robert Mugabe grew up. Photo: The house that Robert Mugabe grew up in in Old Highfield. Bullet holes can still be seen on the facade of the house from an incident during the Rhodesian Bush War. Photo: People are seen registering to vote in Highfield for general elections scheduled to be held in 2018. Photo: City workers are caught out in a short storm on Crest Farm on the outskirts of Harare. Photo: A Hararean does her shopping in a local supermarket. Photo: Shoppers spend time in a local shopping mall. Main photo: Soldiers sit in an APC outside parliament.